Fig. 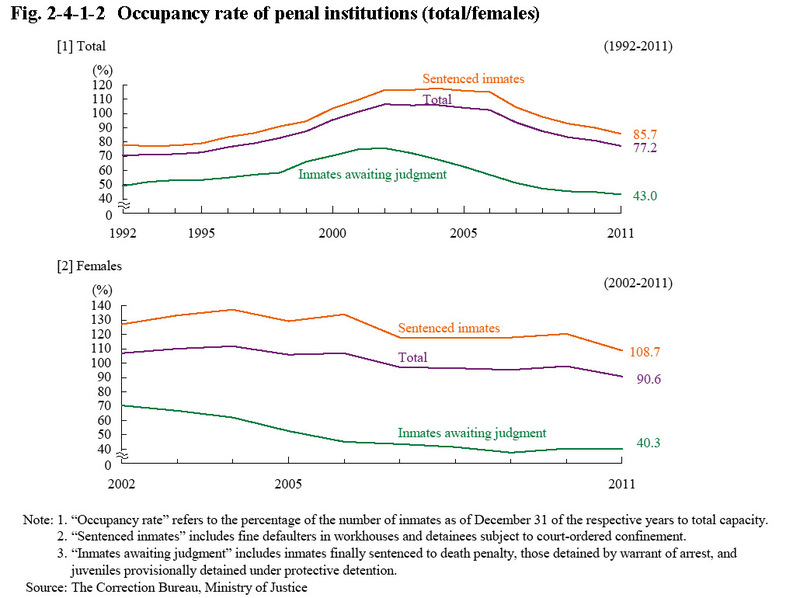 2-4-1-2 shows the occupancy rate of penal institutions (percentage of inmates as of the end of the respective years to total capacity) over the last 20 years (last 10 years with females). The occupancy rate rose significantly from 1993 through to 2002, but then continued to decline every year from 2005. As of the end of 2011 the total capacity was 90,547 persons (of which the capacity for sentenced inmates was 72,434) and the occupancy rate 77.2% (85.7% for sentenced inmates and 43.0% for inmates awaiting judgment), with a total of six (7.8%) of 77 main penal institutions accommodating more inmates than their total capacity (Source: The Correction Bureau, Ministry of Justice). With females, the occupancy rate basically remained stable from 2007, although it slightly declined in 2011, partly due to expanded capacity for female inmates resulting from the accommodation buildings being extended (Kakogawa Prison, Kita-Kyushu Medical Prison, and Mine Rehabilitation Program Center). As of the end of 2011 the total capacity for females was 5,897 (of which the capacity for sentenced inmates was 4,340) and the occupancy rate 90.6% (108.7% for sentenced inmates and 40.3% for inmates awaiting judgment). The occupancy rate with sentenced female inmates consistently exceeded the total capacity by approximately 10%. The inmate burden rate per penal institution official (calculated by dividing the average daily number of inmates at all penal institutions by the fixed number of officials) significantly rose from being 3.04 in 1998 to 4.48 in 2006, and was still at the high level of 3.68 in 2011. The burden rate of female institutions (Tochigi, Kasamatsu, Wakayama, Iwakuni, and Fumoto Prisons, and Sapporo and Fukushima Branch Prisons) was 3.78 (Source: Annual Report of Statistics on Correction and the Correction Bureau, Ministry of Justice).